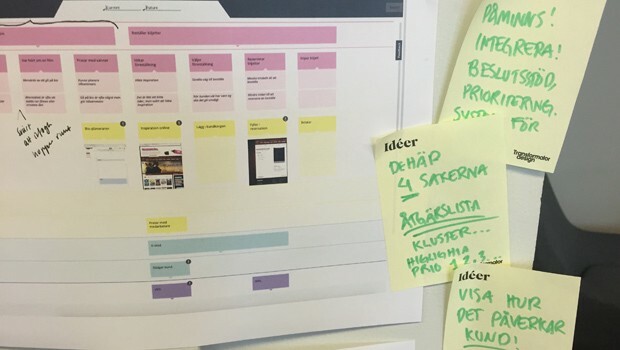 Co-designing services with clients and customers has become best practice in service design. However, digital services are often excluded from the early stages of co-efforts, and are instead subjected to user testing. Whereas a co-design process focuses on developing and refining ideas together with clients and customers using curiosity and empathy, user testing is mainly focused on verifying concepts and functions late in the development process. It puts a prototype in the hands of the user to like or dislike, understand or not understand — but not answering the fundamental question. Will they use it? Or do they even need it? By involving customers early on, you get to focus on doing and building the right services from the start. The process of developing a new (digital) service becomes much more cost efficient, because the service will be hitting the mark for your customers, truly creating value. But there is more. By involving your customers early on, they become natural ambassadeurs for the service. You can put less effort on persuading your customers to start using your service, because they have already built it together with you as they want it. And ingrained in your organization will be a natural customer-centric approach. To start using a new service, a behavioral change is always involved. To avoid that your service becomes this fantastic piece of highway in the forest no one is finding or using, it’s essential to find out what is needed for your customer to change that behavior and start using your service. You need to understand your customer’s needs and incentives, by listening to them and letting them explain to you what the service should be doing. Those insights will help you figuring out what it is your customer truly needs and wants. At Transformator Design we are currently co-developing a digital service together with our clients, Custellence (Customer Experience Excellence), a dynamic service map tool. The idea for the service came about when we understood that our clients was using our deliveries (service and customer journey maps) as a starting point for change implementation. They where asking for a tool that would allow them them to lead their organisation’s work of implementing customer insights, that would help them set priorities and road maps. What they wanted was a systematic approach to customer experience management. So we started concepting and building Custellence, a platform for customer experience strategies and implementation work. A platform that facilitates a customer-centric company culture, and enables the organisation to reach customer experience targets. We did so by asking them to explain. “Why do you need it?” What would the service do for you?” “How is that?” “Tell us more!” By analyzing the answers, we could draw a first rapid prototype. We showed other clients these simple sketches in order for them to develop the concept further, very much similar to the process we use in our service design projects. We always go through iterative cycles of customer interactions, insight analysis, idea generation and prototype generation, showing the prototype to a new set of customers and again gathering insights, analyzing them and generating new ideas for prototypes. After a number of cycles depending on the scope of the project, we reach a customer-centric definition and set-up of the service. What was unique at this point about Custellence, was that after a number of iterative cycles together with our clients, we had developed a high-end prototype that needed to enter our client’s organisations. 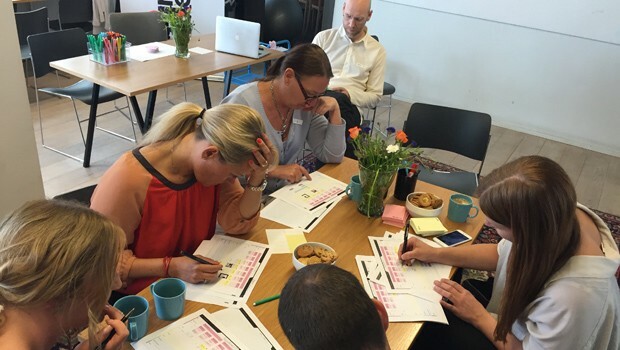 We selected a number of customer experience managers from client organisations (Arbetsförmedlingen (government), SJ (public transportation) and Landshypotek Bank (financial services)) to be our beta phase developers. It was important for us to call them developers and not testers, to emphasize the focus of their effort. Our clients themselves represented both small, mid-sized and large organisations that where either advanced or beginners in terms of customer experience. After a short introduction and equipped with a brief manual (and our continuous support), they got to use Custellence for six weeks. Every week we met with them to discuss ideas, thoughts, problems and needs; capturing their ongoing thoughts from using the system. After the development phase, we brought them all together for a gathering where we talked about not only the details of the service, but also business models, possible software integration and much more. The co-development phase with a beta service was extremely valuable to us. We understood that Custellence in its current form is best suited for organisations that have gained some experience in their customer experience management teams. We also discovered that Custellence was lacking some functions that could manage the need to track and prioritize implementation of customer experience strategies. Furthermore, our clients really appreciated coming together to be inspired and learn from each other. These were insights that we wouldn’t have gained with conventional user testing. Next milestone in our development process is to release a public beta the 1st of October. Then everyone can participate in using and developing Custellence further. Do you want to co-develop Custellence or are you simply curious about our process or Custellence itself? Contact us directly at hello@custellence.com or talk to someone from the development team. You can contact me (Susanna) or Emma Lindahl, Maria Björklund, Olof Bendt and Anders Landström. Do you want to share examples of other digital services that have been developed with the customer at the heart of the process, or do you want to share experiences? We would love to hear about them. Continue the discussion on Twitter, #custellence #beyondusertesting.